Photo courtesy of Jonathan Anderson. 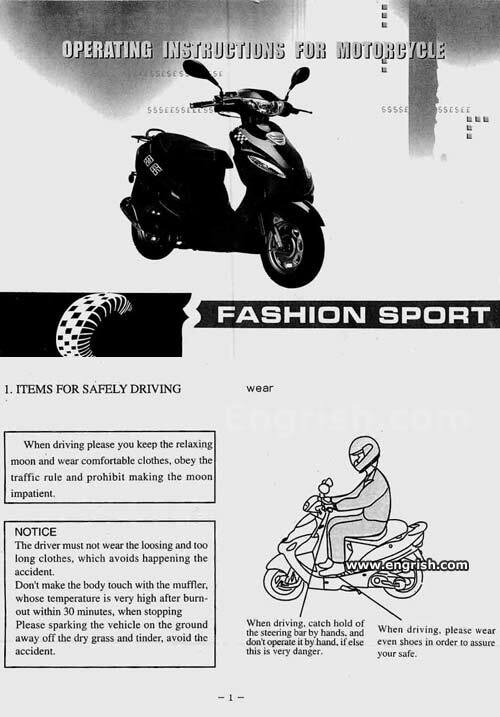 Owner manual for Chinese motor scooter. Probably best to ride naked then. The moon won’t recognise you. Look, ma! I’m driving this Scooter Naked and with no Hands! Don’t operate the steering bar by hand? I guess that means I should just let go ofAAAUUGH! OWW!! You don’t want to make the moon impatient. Or it will come to get you! So this one’s not for any kind of clergy, because they’re all wearing long clothes. Someone: That is NOT a relaxing moon. So… don’t use the sparking brake? That’s shocking! Thanks everybody! I’ll be here all week! This is the *entire* user manual. By the moon, reading these instructions is very danger. Is it alright if I steer wityh my feet, then?. Errr Deng. It is actually a scooter. “…obey the traffic rule.” So there’s only one? Probably something about the moon, I guess. So these instructions are telling me to do a 30-minute burnout of the rear wheel? Of course the moon will become impatient. Though the moon doesn’t have any air. Because who needs an impatient moon? My moon is in a particularly unrelaxed state after a few minutes of burnouts. If I catch hold of the steering bar by hands but don’t operate it by hand, if else there is very danger . . . well then, I’ll just steer with my impatient moon. Question, how do I see where I’m going? Steering by not by hand but by what? The foot? Or the moon? Wear too-loose clothing and other drivers will lose patience with your moon. Let’s go over the check list one more time: Relaxing moon, keep. Impatient moon, prohibit. Got it! If we don’t want to make the moon impatient we should take the rocket ship, it’ll take us ages to get there on this. That prevention to accident the very danger is much justify. Impatience the moon is explanation happening understood. But officer, I was just following the Operating Instructions. @Someone: The crap has literally been scared out of me. Obeying the traffic rule- getting the cuff out of my way! I was on the moon…with Steve. Sun in Capricorn. Impatient moon over Beijing. Drive however you want when it’s the sun’s watch. They just don’t want you lookin’ like a fool with yo’ pants on the ground. aw man I gotta even wear shoes?! gotta wear even shoes! aww i guess i can’t buy them odd shoes no more! it might make the moon impatient! Holahooohhh…..The vehicle is sparking on the dry grass, I have to drive without a hand down the hill…or moon will get mad. Chapter 1 of Dan Brown’s new novel ‘The Lunar Cycle’. This thing is obviously written in code. Catch the steering bar by hands, but operate it by what, feet? And try you not moon neighbors again one more. They’re tire off it. No driving in uneven shoes! When at safe distance bike will combust. Got it. Don’t wear long loose clothes, don’t grab the muffler, wear matching shoes, don’t electrify the vehicle, only use my hands when not using my hands to steer – and for God’s sake DON’T PISS OFF THE MOON. Easy.